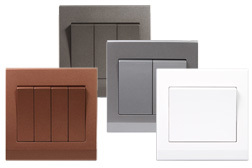 Modern design with interchangable covers in 4 finishes. 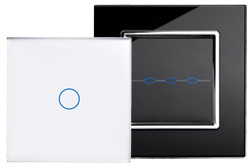 Stunning glass sockets and switches - choose glass or glass with chrome trim. Your choice with these Flat Black or White Sockets & Switches in a smooth Matt finish. 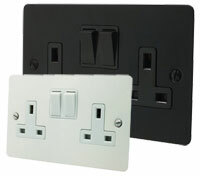 Do you need larger size Sockets & Switches to cover over the edge? Then see our Large Ranges. 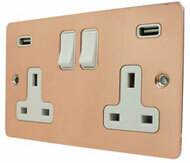 Add something special with beautiful copper sockets & switches to your room. See Polished Copper ranges. 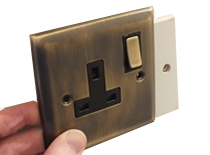 Welcome to Super Sockets – we aim to provide you with a range of stylish good quality Sockets and Light Switches at “Everyday Low Prices”. With our simple low pricing policy you simply cannot lose. All items are available for a quick 2 - 3 day delivery and if you order before 1pm and choose the express delivery option you will receive your order the very next day. Low prices and a quick delivery is the aim for us here at Super Sockets so go ahead and take a look around our on line store. We hope to find something of interest and if there is anything you need help with give us a call or send us an email (you will find our details on every page). Plug socket and USB socket all in one socket, now available in most ranges.